Did You Know the glenohumeral joint (shoulder joint) is considered to be the most mobile and least stable joint in the body? 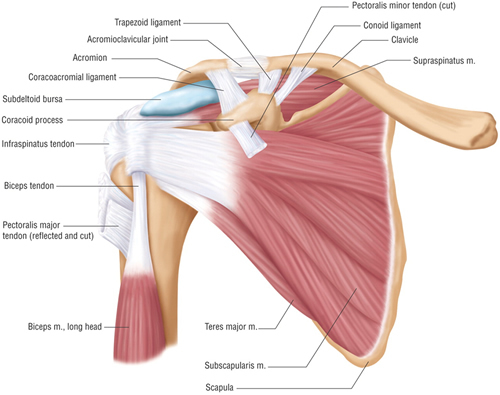 The shoulder joint is made up of a complex interplay of bones, muscles and ligaments. Dysfunction in any one of these structures can affect the function of the shoulder joint resulting in ongoing pain, weakness or instability. Injuries within the shoulder are not always mutually exclusive. Rotator cuff injuries, bicep tendonitis and labrum tears are just a few of the injuries seen in the shoulder joint among Crossfit athletes. Why do they occur? And what can you do about it? The rotator cuff is comprised of four major muscles; supraspinatus, infraspinatus, subscapularis and teres major. Supraspinatus passes through the subacromial space – made up of the head of the humerus and the scapular. Also travelling through this space are the biceps tendon and the subacromial bursa. When the thoracic spine has limited mobility it causes the scapular to be in a mechanically incorrect position. If the scapular tilts forward of its correct position it causes the subacromial space to be narrowed, which results in impingement of the biceps tendon, supraspinatus and the subacromial bursa, causing inflammation. If you then go and add an overhead movement such as a kip or push press you’re just exacerbating the problem. So what about the labrum? The labrum is a cuff of cartilage within the shoulder socket, which forms a cup for the head of the humerus to move within. This is also where the long head of the biceps tendon attaches. The purpose of the labrum is to assist the muscles of the rotator cuff, providing extra stability and range of motion. So it makes sense that if the rotator cuff is not functioning at 100% that the labrum and biceps tendon will have to work harder. Going back to overhead movements, when the rotator cuff is already weak and you’re performing something like a push press, it’s going to fatigue quicker than normal. This means that the labrum has to step in. It also means that the overall load bearing capacity has dropped and something’s got to give, if it’s not your rotator cuff then it will be your labrum. When it comes to shoulder rehabilitation the first step is to stop those movements that are causing irritation – rest. Also look at your form, how can you improve it? Talk to your Crossfit coach, get them assess your form, ask them to film you during a WOD and watch it back together. The next step is to seek professional advice elsewhere, perhaps some manual therapy.